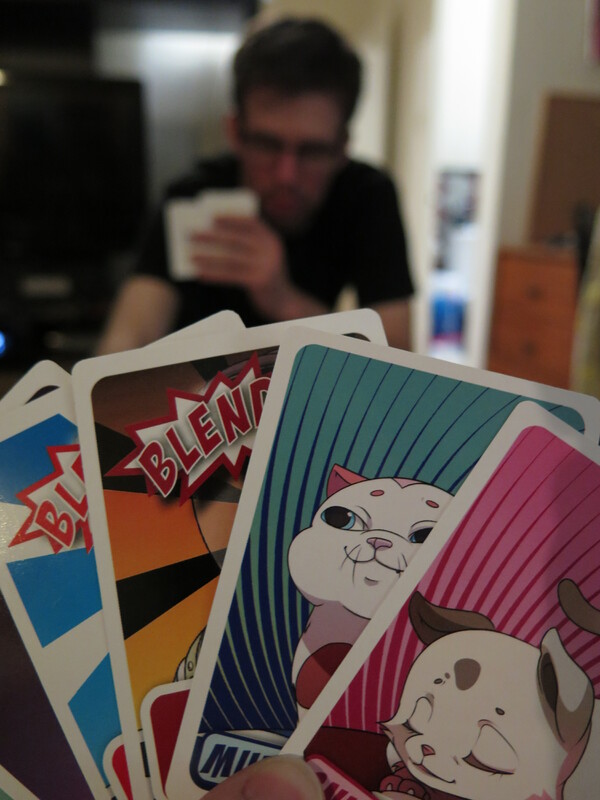 Normally Kenny will be writing the board game reviews, but as I am Geek Collateral’s resident cat fanatic, it is my pleasure to introduce you to Kittens in a Blender. It’s a fairly simple, deeply twisted card game: pick a kitten colour. Save your kittens from being blended. Turn your opponents’ kitties into cat purée. 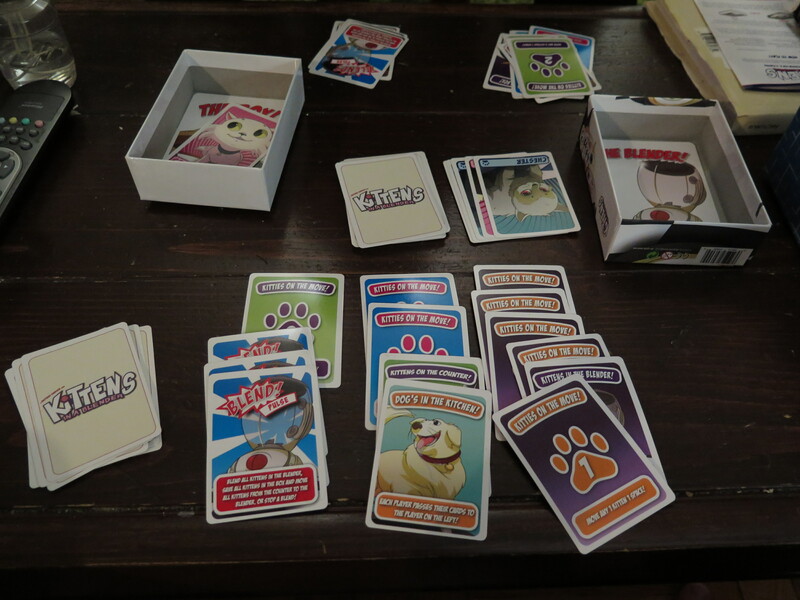 The deck includes kittens for each player, cards that enable you to move kittens, cards to blend kittens, cards to save kittens from being blended, and cards that cause each player to pass their hand along. You start with six cards in each player’s hand. Each turn, you must use two and then pick up two. You want your kittens safe in the box (or at least on the counter) and your opponents’ kitties preparing mewing piteously from the murderous kitchen appliance. Whether you play with subtle strategy or for maximum carnage is up to you. The game is quick and violent. 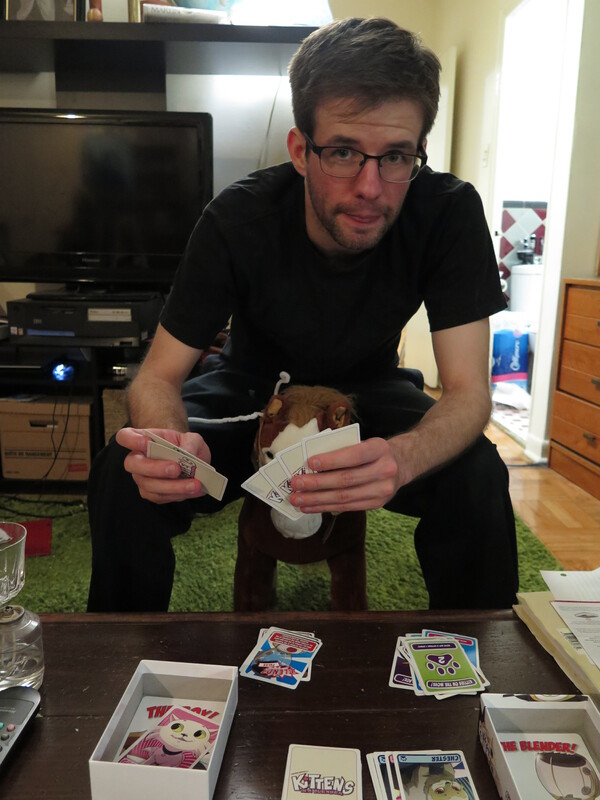 I played against our CEO, Devin Edwards (though you can play with up to 4 people), and he made horrible whirring sounds when kittens died. He also insisted on reading out the names of the blended kittens at the end of each round. Sadist. Devin contemplating the deaths of countless kittens/trying to look cute like the innocent kittens he is about to murder. I was surprised by how affected I was by the blending. Maybe if the kittens didn’t have names or such cute cartoon faces, I would find it less upsetting. I found myself apologizing to Devin’s cats while I placed them in the blender, and I decided which of my own kittens to save according to how adorable the cards were (Ninja is just too cute to let die, but I don’t have quite the same attachment to Chester). Emotional trauma aside, Kittens in a Blender is a fun, fast-paced game that’s perfect for those with limited time (or a short attention span) and a dark sense of humour.